Low prices. OrangeSmile.com offers car hire service in Seychelles on the lowest-rate-guarantee basis, since we work with car suppliers directly. For your search criteria in Seychelles, we always select and show the best rental offers. The car reservation process consists of 3 simple steps: (1) search for available cars for your dates in Seychelles; (2) select your car type; and (3) fill in the booking forms. Once the reservation is completed, you will receive a confirmation voucher to your email address. During the booking process, please check your rental conditions. To pick up your car at the rental point in Seychelles, you need to provide our confirmation voucher, your driving license and a valid credit card. The final payment is normally carried out at the pick-up point. Our car hire points in Seychelles accept VISA, MasterCard, etc - please check your rental conditions. At the pick-up point, please read the handling manual and check the car for present defects. 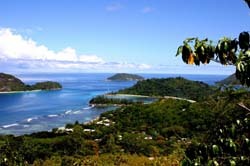 OrangeSmile.com wishes you a pleasant journey to Seychelles! The car hire reservation system OrangeSmile.com allows renting a vehicle in Seychelles within 10 minutes. Our largest database of car suppliers enables us to provide you a rental car in Seychelles at the cheapest rate ever possible. At rental locations in Seychelles we offer the following car sizes: mini, compact, economy, standard, premium and luxury. The following car types are available in Seychelles: Sedan, Hatchback, Jeep, Cabriolet, Coupe, Minivan and Minibus. There are several interesting places in Victoria suburbs, for example, the village of Craftsmen, where travelers can purchase memorable souvenirs and get acquainted with lifestyle of local people. There are several large nature reserves and parks not far away from that capital, such as the Royal Garden, the National Marine Park and Morne Blanc piedmont region. When describing nature attractions of the islands, it's simply impossible to fail to mention Silhouette Island. This island is famous for its magnificent equatorial forest - the largest and richest forest in the country. Despite that fact that this island is not very populated, it has everything needed for great rest. In order to become eligible for coverage offered by the 'insurance against burglary' package in Seychelles, you will have to return the keys to the rental office. Therefore, it is important to keep your keys in a safe place out of reach of other people.